Today I found out Ben & Jerry’s was originally going to be a bagel company. Ben Cohen and Jerry Greenfield ended up changing their minds when they found out how much it would cost to get all the needed equipment for making bagels. Instead, in 1978, they both took a $5 correspondence course from Pennsylvania State University on ice cream making. They then took $12,000, $4000 of which was borrowed, and converted an old gas station in Burlington, Vermont into an ice cream parlor called Ben & Jerry’s Homemade. Before opening the ice cream shop, Jerry Greenfield was a lab technician, in New York, who tried three times to get into medical school, failing each time. Ben Cohen attended various colleges, eventually dropping out and settling on working as a crafts teacher for emotionally disturbed children in New York. In New York, Ben and his old friend from Jr. High and High school, Jerry Greenfield, shared an apartment in Manhattan before once again parting ways. Eventually, the two reunited and deciding to start some sort of a food company, eventually settling on ice cream, hoping to find something that was “more fun” than their current jobs. When they sought out a suitable location for their ice cream shop, they set the criteria that it should be some place with a very warm climate; should be a college town; and should be a town where there were no other ice cream shops. In the end, they found that every college town in a warm climate already had one or more ice cream shops, so they settled on Burlington, Vermont, because it was one of the few college towns that lacked an ice cream shop. By 1983, just five years after they first opened their doors, Ben & Jerry’s products, at their own retail stores and sold through various other outlets, had gross sales of around $2 million. Just one year later, they achieved a gross of over $4 million. One year after that, they were grossing $9 million. One year after that, in 1986, they grossed over $20 million. In 1987, they finally broke their amazing “doubling” streak and only grossed $32 million. The following year, their rapid growth caused President Ronald Reagan to award the two the “U.S. Small Business Persons of the Year”. In April of 2000, a mere 22 years after Ben & Jerry’s Homemade Inc. was founded, the two sold the now publicly traded company for $326 million to the British-Dutch food company Unilever. At the time, annual sales were just shy of $200 million. Today, Ben & Jerry’s ice cream receives annual sales of around $240 million. 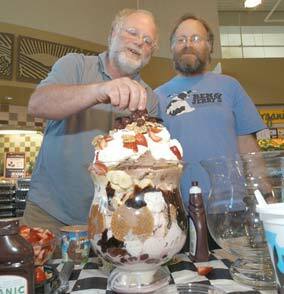 Ben and Jerry first met in a Jr. High gym class at Merrick Avenue Middle School. The two were both lagging behind while running, which caused the gym teacher to yell at them and warned them that they’d have to run two miles if they didn’t pick it up. Cohen responded by yelling back at the teacher: “If I don’t do it in under seven minutes the first time, I’m certainly not going to do it in under seven minutes the second time.” From there, the two became fast friends before eventually parting ways after graduating high school to attend different universities. While Ben & Jerry’s ice cream quickly gained popularity, many of their initial attempts at making ice cream were slightly less palatable than their public offerings. According to Jerry, one of the more interesting early attempts was rum raisin ice cream that ended up stretching like taffy and bounced if you threw a ball of it on the ground. When Ben & Jerry’s grew in popularity to the point where they tended to be more involved in the business side than ice cream making, the two wanted to sell their company. They felt that large businesses exploited workers and communities and they wanted no part of that as businessmen, instead of ice cream makers. They eventually decided to keep the company and tried to focus on being a positive force in their community. Early attempts at that were to set a goal, which they ultimately had to abandon, that no employee in the company would ever make more than five times (later seven) what the least paid employee made. This was ultimately completely abandoned in the 1990s , when they had trouble finding good people to fill out the upper ranks of the company. As far as community support, they pledged 7.5% of all pre-tax profit from Ben & Jerry’s to be donated to various charities. Since their inception, Ben & Jerry’s ice cream was touted as “all natural”. However, in 2010, the company was forced to stop labeling their ice cream and frozen yogurt such when it was discovered by the Center for the Science in Public Interest that corn syrup and many other artificial ingredients were used to make their ice cream. Contrary to rumor, Ben and Jerry do not appear to have ever been a couple. In fact, Jerry was dating his eventual wife when Ben & Jerry were roommates. He also left the company for a few years to help his future wife, Elizabeth, pursue her Ph.D. in psychology. The rumor that Ben and Jerry are gay received a huge boost when Ben & Jerry’s came out with the “Hubby Hubby” flavor for one month, which featured two men getting married on the cover and was in support of gay marriage rights. Somewhat humorously, the “Hubby Hubby” flavor ice cream featured hollowed out fudge covered pretzel sticks, being a rebranded version of the popular flavor “Chubby Hubby”, which is a vanilla malt swirled with chocolate and peanut butter and includes the chocolate covered, peanut butter filled pretzels. Ben Cohen had to undergo quintuple bypass surgery in 2001, at the age of just 49, to clear several blocked arteries. These blockages were attributed to years spent eating copious amounts of ice cream.